Foundation House is officially open! 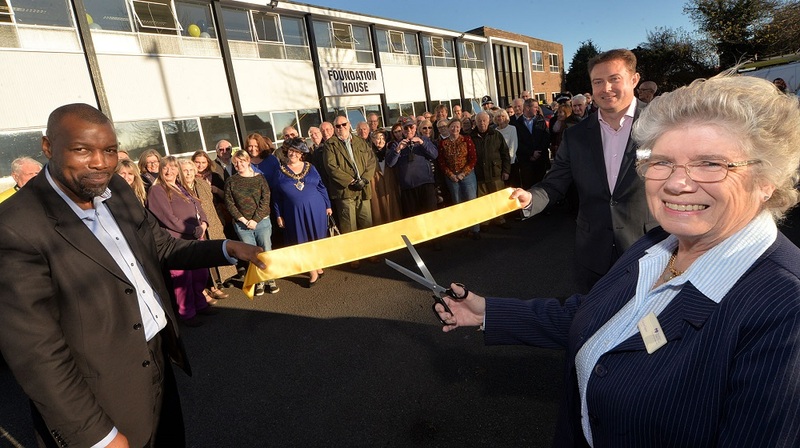 THE RIBBON has been cut to mark the official opening of Foundation House – the brand new community hub for Stratford-upon-Avon. Stratford Town Trust unveiled plans for its vibrant new facility bringing the community together under one roof, at its AGM in the summer. As well as rooms available for hire, Stratford Town Trust will also be able to grant space at Foundation House to local charities and groups. Organisations were asked to register their interest, with a significant amount of flexible space available at the new hub, which occupies a 950-square metre industrial unit in Masons Road. The demand was overwhelming with more than 45 groups expressing an interest to date. Since the summer, work has been undertaken to refurbish the building, with priority given to getting the building ready for all users. Guests gathered on Friday (November 24th) for the official opening; a chance to meet the growing Foundation House community and have a look around. To date, seven local organisations have been granted dedicated space within Foundation House. Second Thoughts Drama Group was the first to start moving in, earlier this month. The rest of the groups are now set to follow. “The demand for Foundation House exceeded all expectation,” Justin Williams, Chief Executive of Stratford Town Trust, said. “We have been overwhelmed by the number of diverse groups approaching us for space – and wanting to work together with other organisations to create a real hub. Foundation House offers both large and small spaces over two floors, with disabled access and 40 parking spaces. As well as the space being granted by the Town Trust, spaces can also be let, with hot desking facilities and four meeting rooms/event spaces also available for hire and community use. These are: The Engine Room – a large board room, The Snug – a smaller meeting room, The Green Room – a more informal coffee lounge meeting space, and The Runway – a large performance/exhibition/flexible meeting or event space. A hub manager – Frankie Williams – has also been appointed.